PPH plus is a specialized Contract Research Organization (CRO) that provides unsurpassed operational and consultancy services in and around clinical trials, phase I to IV. 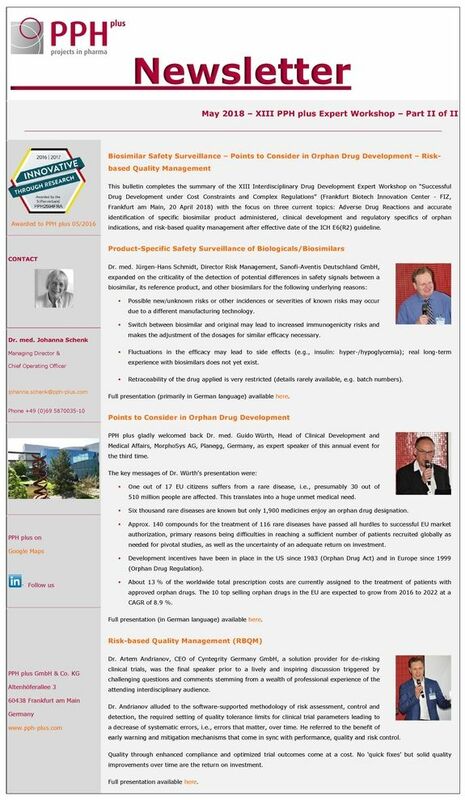 The predecessor company PharmaProjekthaus was founded in 2004 and renamed PPH plus in 2011. PPH plus’ custom-built business model brings major values and benefits for customers worldwide. Our team drives the customer’s clinical operations with skillful leaders. We serve the global pharma and biotech industry in all clinical development phases on projects of any complexity and size. Our mission is to boost clinical development by providing state-of-the-art management consultancy and leadership in clinical trial programs to pharma and biotech companies from all over the world. We deal with customers, employees, colleagues, and suppliers in a professional, respectful, ethical, honest, and fair way. We conduct our business with a strongly developed sense of responsibility, highest demands on the quality of our services, and in a spirit of partnership. We identify ourselves with the business goals of our customers. We are hands-on, enthusiastic, have a can-do attitude and promote positive thinking. We acknowledge outstanding performance and enjoy celebrating successes reached for our customers together with all colleagues who significantly contributed to.